Last weekend, my computer bit the bullet. Luckily, I found a replacement: The Lenovo Yoga 900-13ISK which I'll review today. Last weekend was definitely not my finest moment. There was a lot happening and it was one of those weekends where I was glad to go to work on Monday. I'm sure you've had those days before. On Saturday, my primary development machine bit the dust. Unfortunately, I needed a laptop. Not next week, not three days...now. Saturday morning, I was scanning the 'Net for the best laptops currently on the market. My requirements for a replacement laptop were simple: Intel I7, 16GB of RAM, and a pretty beefy SSD (Solid State Drive). That's it. In the past, I have always purchased a Dell of some kind and had my eye on a Dell XPS 15-9550 which had my specs. I was wondering if anyone locally had this machine. After looking online, the cheapest I could find the laptop was $1,800. I needed something sooner that wouldn't break the bank and was available...today! I went to MicroCenter. They didn't have anything that matched my specs. BestBuy? The only thing they had that matched what I was looking for was the Lenovo Yoga 900. From what I understand, this was a laptop sold specifically through BestBuy and no one else. I usually don't go into BestBuy, but I went against my judgement and bought the Lenovo Yoga 900 from BestBuy because the Dell I wanted (Dell XPS 15-9550) was $600 more than what I wanted to pay...and I received a big tablet in the process. To my friends, Yes, I went into BestBuy. And Yes, I bought something different than a Dell. I actually bought the Lenovo Yoga 900-13ISK for $1,250 (open box). So far, I don't doubt my decision (yet). The Lenovo 900-13ISK is a 2-in-1 convertible laptop that converts from a laptop to a tablet and back. You can use it as a stand (tent) as well. Before I left on Saturday, I did check CNet and found out that CNet awarded the Lenovo Yoga 900 as one of the 100 best products of 2015 at #70 (Review). When I got home, I took the laptop out of the box. 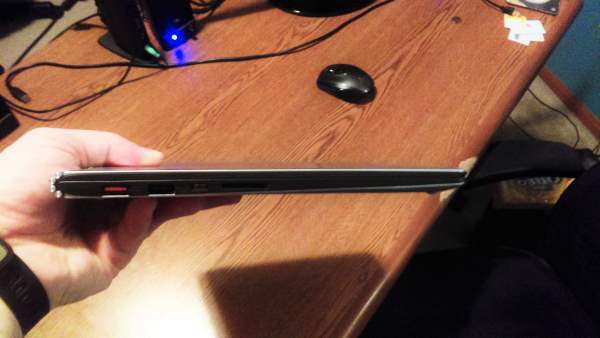 It was extremely thin...and I mean thin. It could rival an Apple laptop. The height is 0.59 inches, width is 12.76 inches, and the depth is 8.86 inches. Also, Lenovo mentioned that their Yoga 900 would be a little heavier than their 2.4-pound Yoga Pro from last year. The Yoga 900 is 2.84 pounds. Considering that my Dell was double that, I was pleasantly surprised that I wouldn't break my back carrying it around. The keyboard is surrounded by a black mesh covering and I can see it getting dirty quicker than expected...so I will probably be looking for a laptop skin sometime soon to keep it clean. 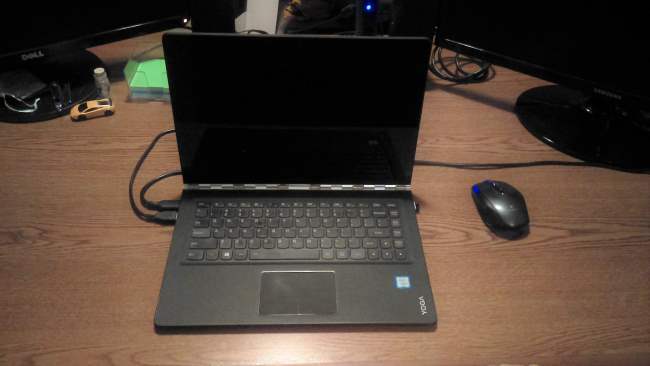 The Power button is on the right side of the laptop so try not to bump it if you move your Lenovo Yoga with your hands and accidentally turn it off. Of course, when you get a brand new laptop, everyone is pretty impressed on the first day and they go, "Wow...this is fast!" Umm, yeah, because there's nothing on it. However, it didn't make a difference if there was bloatware on there or not. When I booted it up, it was as I expected. It came up in less than 10 seconds. I logged in and started various installations include Visual Studio 2015 and MS SQL Server along with Management Studio. One co-worker said that it would take 2.5 hours to install Visual Studio 2015. It took me 40 minutes to install all features. FAST installations. This is what I'm talking about! After installing SQL Server, I ran Management Studio. There was a huge problem. I was immediately dropped into the world of High DPI (Dots Per Inch). The Lenovo Yoga's touch display is a whopping 3,200 x 1,800 pixel screen. Not many applications can handle this particular screen resolution. After searching on the web, I found Scott Hanselman who mentioned that Living a HighDPI Desktop Lifestyle can be Painful. How right he was! My SQL Server Management Studio was so squished and messed up, I couldn't read anything on the screen. Luckily, there was a solution to this issue on SQL Server Central with a post called SSMS in High DPI Displays How To Stop The Madness. This saved my bacon and fixed my issue. Now I can use SQL Server Management Studio. Keep in mind that this is not the laptop's fault, it's the applications that the developers wrote. Developers did not expect to write software for such a high resolution screen, but there are ways around as mentioned in the above link. Now that I've had the laptop for a week, I'll touch on some points that stood out to me and how to fix these issues. First, they need a bigger Backspace key and a bigger Shift key on the right. Every time I would try to hit the backspace key, I would hit the home key. It may just take some getting used to with the new keyboard. Since the Yoga 900 is so thin, there isn't any room for an optical drive or even a Ethernet port. You would need to purchase a USB external optical drive (CD/DVD/Blu-Ray) and a USB Ethernet Adapter. While I haven't tested the battery yet, CNet has benchmarked it at over 8.5 hours with constant video running. Sounds like a performant battery. I do like the feel of the keyboard. I haven't tried it yet, but would a stylus work on the touch screen for taking notes? Anyone? While I don't play games very often, there are times when I fire up Guild Wars 2 and take some time to relax. However, the graphics card isn't that fantastic, but it gets you by. The laptop isn't like a gaming laptop, but it still performs well. As I continue to use the Lenovo, I'll probably add more to this list. UPDATE (2016-Jun-06): Unfortunately, I need to have my laptop sent to Lenovo for repair. There is a clicking sound in the top right of the keyboard that is driving me crazy. Since the only moving parts in the laptop is the audio and the fan, I'm guessing something is bumping against the fan causing the clicking noise. This is my only computer I have. I may be looking to buy another cheapo laptop for backup purposes. I was told from BestBuy my laptop may take from 2-4 weeks for repair. Even though I took a chance on buying a Lenovo instead of a Dell, I'm still quite pleased with my purchase so far. I had to have a workhorse of a machine for my development needs and it definitely delivers. If I was asked what could be improved on the Lenovo Yoga 900, I would have to say a couple extra USB ports for an external optical drive. Does anyone else recently purchase a Lenovo Yoga 900? Do you like it? Post your comments in the section below. If you don't mind the sacrifice of an optical drive or an ethernet port, The Lenovo Yoga 900-13ISK 2-in-1 ultraportable and convertible laptop can utilize the processing power to accomplish any task you can throw at it. Light and compact for such a powerhouse.